Armwrestling has a soul, we are here today, we work for it, but the sport will be there long after we will be gone. It and only it is the most important, so as a competitor, official, referee or everyone related to this sport we bring a contribution to the future and the image our sport has and will have. The highest dream, Olympics, someday will become true, but we must build the dream piece by piece, and yes, the competitors deserve, they are the highest treasure our sport has. The competition level, what the competitors bring at the table, the emotions, the fighting spirit, the energy, deserve the Olympic dream and much more. There are no words to describe the competitors and competition level, videos and pictures describe it better. 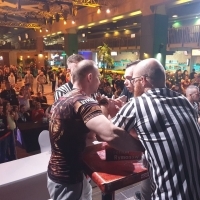 As for organizing the championships, we have through Mazurenko Team the best stages, venues and everything is at top level in every single detail, as it is needed to progress and catch the eye of the viewers, make Armwrestling well known to more people, expand it in every country, gain popularity because indeed Armwrestling deserves it. Competitors fight, referees enforce the rules and the officials work for the sport. We serve Armwrestling and this is how it should be, now and forever. We build the future of this sport, and the future is bright, has potential and the most important, it has the DNA of a true Olympic sport. History has a pattern to always remember the great ones, and it will remember people like Harri Naskali or John Miazdzyk when the day will come legends, people who had a big contribution to the history and history is what brings and connects the past and the future. Links who make the DNA of a sport. Until then is in our hands, honour Armwrestling and serve it the best way possible, with respect and fair-play. It was a long transition from the beginning of the sport in an organized environment to the high level environment that was at the last European Championship. Without the right people nothing could have been possible, so Armwrestling has a hope. A sport that has the people ready to organize an European Championship less than a year deadline in such a great manner. A sport where competitors are fighters, warriors, true examples on how to fight, in a world of marketing superstars, that means sport, the word, the definition, his true essence. As long as everybody who has a contribution will stay united, and work for Armwrestling and nothing more, the future is greater than ever.